As PR practitioners, we’ve likely all received a panicked call from a client asking for counsel following an unfavorable news item or an unfolding emergency situation. Remaining calm during these scenarios and enacting well-thought out plans can help reduce the impact of a PR crisis. Helping clients navigate uncertain situations, particularly in this age of social media, is a vital part of any ongoing PR strategy. A recent crisis management workshop presented by the North Carolina chapter of the Public Relations Society of America (PRSA) led by Judy Hoffman with JCH Enterprises addressed this topic. The workshop covered various tips and best practices for an effective crisis communications plan–below are the top five take-aways. 1. Have a crisis management plan in place. This involves completing a crisis worksheet for every possible negative scenario your company or client may face, outlining potential threats – lawsuits, on-the-job-accidents, security breaches, etc. The worksheets should include strategies on minimizing damage and identifying key personnel who will be involved in developing and delivering a response to the media. Evaluate your crisis response every 6-12 months to ensure that all of the information is up-to-date as it pertains to your organization. While there is a chance an event arises that isn’t addressed with the anticipatory scenarios, it is likely that there are strategies that are applicable to the current situation. 2. Your crisis management plan should evolve as the media does. Social media has dramatically shortened the response window once a crisis does arise. What used to be a 2-3 hour delay before a story received widespread attention is now about 20 minutes due to social media. Having a plan in place is a vital key to successfully getting ahead of any potential situation your organization or your client may face. 3. If a story does hit the media, aim for one-day, local-only coverage. It’s inevitable that despite planning and effectively executing that plan, an unfavorable story about your client or organization will garner coverage. Whenever possible, try to contain the coverage while being cooperative with the media. 5. For pre-identified crises, have prepared blanket statements on-hand. As part of your overarching crisis management plan, prepare statements that have been pre-approved by your company’s stakeholders, including the legal department. Whenever possible, develop a statement for each potential situation that includes easy to fill-in placeholders. This will enable you to be more responsive to the media when events do happen. BONUS: Keep your media responses concise. Think in 30-second sound bites. Strive to include three major, carefully worded messages in your media responses that are worked repeatedly into any interview – without sounding like a broken record. A little foresight and careful planning can help you minimize the impact of an unfavorable situation for your client or organization. 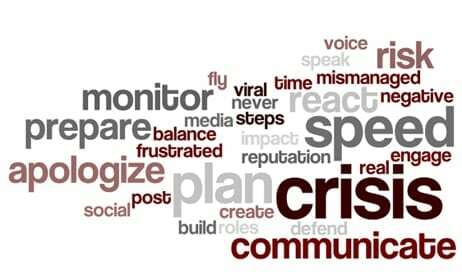 The road to an effective PR crisis management plan starts with a few basic steps that can help you navigate just about any scenario that arises. Does your company need help devising a crisis management plan? Contact DPR Group to see how we can help you navigate potential threats.